The VFW Post 10732 is intending to do more of these projects. However, younger veterans from Iraq and Afghanistan are needed. It is tough when we ask an 85-year-old veteran to climb a ladder to paint. But they do it gladly. Berlin VFW Post 10732 was in search of a veteran needing assistance with their home. It has been difficult to find a needy elderly veteran, Post Commander Gary Barwikowski pointed out. 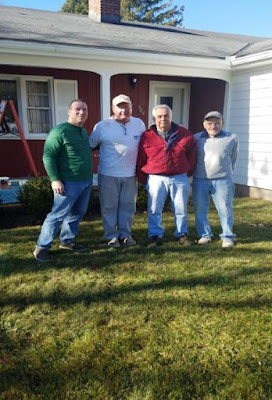 From left, veteran volunteers Stu Topliff (Desert Storm), Brad Parsons (Iraq), Dan McKeon (Vietnam) and Bob Dornfried (Korea).